If you have OFB, this probably looks familiar. It is indeed the OFB knight’s open helmet, only I’ve turned it into a halfhelm so that Sims can put it on and take it off without the help of a squire and/or blacksmith. Also, even though the night is dark and full of terrors, because the helm has a plume and not a lightbulb, it doesn’t glow (which also means you can’t tell how many more uses it has), since glowing plumes wouldn’t make sense. 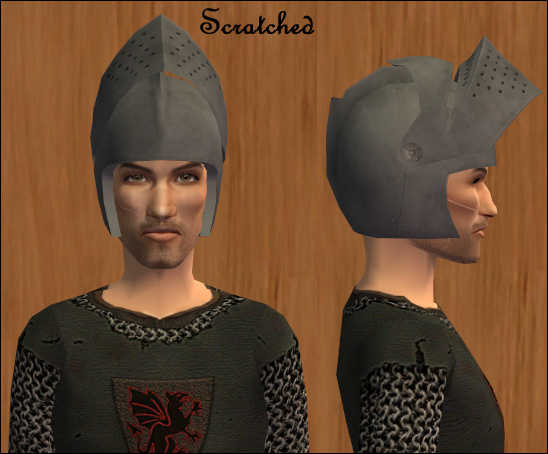 However, if and when the helm burns out because your Sims tried to wear it when they shouldn’t (Edmure, I’m looking at you), there will still be sparks and smoke. Which admittedly doesn’t make any more sense than glowing plumes, but if I had taken that out your Sims would be holding their noses at and try to whisk away… absolutely nothing, and that would just look silly. So there will still be anachronistic sparks. You can only have one helm in your game at a time! If you want to use a different colour Thinking Helm (or somebody else’s default replacement for it, for that matter), you must delete the one you are currently using from your Downloads folder first. This entry was posted on 16 February, 2013 at 19:29	and is filed under DEFAULTS, Defaults, DOWNLOADS, Medieval-ish, Object Defaults, THEMES. You can follow any responses to this entry through the RSS 2.0 feed. You can leave a response, or trackback from your own site. Thanks! 😀 I really like the red one, too (and no Sim synapses were fried by it, either, even though the Sim wearing it isn’t the sharpest sword in the armoury ;)). Awesome! I’ve been avoiding thinking caps in my game for just this reason!